Definition at line 95 of file fde.h. Definition at line 103 of file fde.h. Definition at line 105 of file fde.h. Definition at line 97 of file fde.h. Referenced by _comm_close(), diskHandleWrite(), and file_close(). Definition at line 102 of file fde.h. Definition at line 104 of file fde.h. Definition at line 100 of file fde.h. Definition at line 101 of file fde.h. Definition at line 96 of file fde.h. Referenced by _comm_close(), AlreadyTimedOut(), comm_local_port(), comm_poll_tcp_incoming(), commCloseAllSockets(), commSetConnTimeout(), commUnsetFdTimeout(), fde::dumpStats(), epolltype_atoi(), fd_close(), fd_open(), fdDumpOpen(), file_close(), file_write(), kq_update_events(), and Comm::SetSelect(). Definition at line 106 of file fde.h. 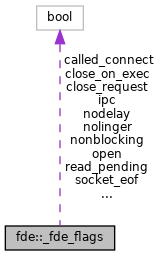 Referenced by comm_poll_tcp_incoming(), commIncomingStats(), Comm::DoSelect(), epolltype_atoi(), kq_update_events(), and Comm::SetSelect(). Definition at line 99 of file fde.h. Definition at line 108 of file fde.h. Definition at line 98 of file fde.h. Referenced by diskHandleWrite(), file_close(), and file_write().